Friday, July 1, 2016 (SALT LAKE CITY, UTAH) Please join us in wishing Michelle Fogg, the founder of Utah Food Allergy Network (UFAN), the very best in her resignation as President after a decade of service. Michelle’s dedication, passion, and hard work have helped countless individuals navigate life with food allergies. She obtained UFAN’s 501(c)3 nonprofit designation and has planned and managed numerous community events including UFAN’s Food Allergy Education Conferences, Easter Egg Hunt, Trunk or Treat, and Kids’ Summer Day Camp. She has also served as Chair/Co-Chair of the FARE Walk for Food Allergy in Salt Lake City multiple times. A true believer in collaboration, Michelle has united parents, patients, physicians, school nurses, community agencies, and schools. She has provided mentorship for support group leaders at home and abroad while serving on numerous state and national boards–allowing for excellent partnering and establishing credibility of the UFAN organization. Michelle has also been long known for her passionate commitment to advocacy work, including lobbying and obtaining sponsorship for state and national laws. Under her leadership, UFAN has grown to over 1,000 members and followers who work together to advance common goals. 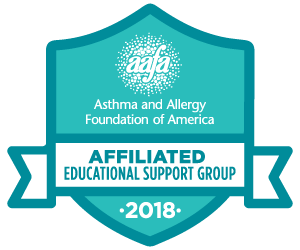 Michelle has provided training to many, including the Utah School Nurses Association, and co-created an online community education program, approved by the Utah Department of Health, which provides epinephrine training to individuals across the country. UFAN members have been greatly blessed to have Michelle in their midst to bring about this wonderful organization. Michelle will remain a strong advocate for those with food allergies and eosinophilic disorders, and will continue to support UFAN’s efforts and provide vision as she joins our Advisory Board. UFAN cannot say enough good things about Michelle and express our deepest gratitude for the strong foundation she has provided us. UFAN welcomes Julie Alverson as the new President of the Board of Directors and Melissa Sauter as Executive Director. Julie has served on the Board in multiple positions and as Volunteer Program Manager for nine years. She is intimately familiar with UFAN’s mission and membership and her volunteerism has demonstrated her dedication to serving the food allergy community. Melissa Sauter joined the UFAN Board of Directors last year and has a solid foundation of food allergies and eosinophilic disorders. She is an amazing advocate and passionate about UFAN’s programs and initiatives. Melissa will work with the Board and provide direct oversight for committees and services. UFAN has strong leadership in place which will continue to carry our mission forward, and as always, we look to our members for additional volunteers and strengths as we network to serve the food allergic community of Utah. We look forward to a very bright future!